Have you seen the new TV show, The Marvelous Mrs. Maisel? It’s on Amazon Prime, and recently won the Golden Globe for Best Television Series—Comedy, so I decided to give it a chance. It’s quite funny, and has some brilliant insights about the creative process. The show is about Midge Maisel, a divorced housewife trying to make it as a comic in 1958 New York. In episodes 1–4, we see Midge discovering her passion and natural fit for comedy. Each time she gets on stage to perform, the audience goes wild, filling the room with laughter. This positive feedback gives her a huge ego boost, tells her she’s going in the right direction, and pushes her to keep doing comedy. In the fifth episode, “Doink”, things take a turn. Midge gets on stage to perform at her usual venue, but this time, she bombs. She flubs her lines. She insults the audience. She gets distracted. She gets heckled. She gets flustered. And she gets no laughs. She bombs so bad, she quits in the middle of her set. As she walks off stage, she complains about the lights and the mic. As she vents to her manager, Susie, she complains about the audience. Lots of people want to be creative. Lots of people want to make art. They want to tell jokes, they want to paint, or they want to draw. But most of those same people don’t want to put in the work to get there. They want brilliance on the first try. They want perfect execution every single time. And if they encounter a moment when they are not brilliant, when they are not perfect—they quit. We have to remember not to expect brilliance and expertise immediately. No one is an expert when they try something new. Everyone begins an amateur. Everyone begins with mistakes. 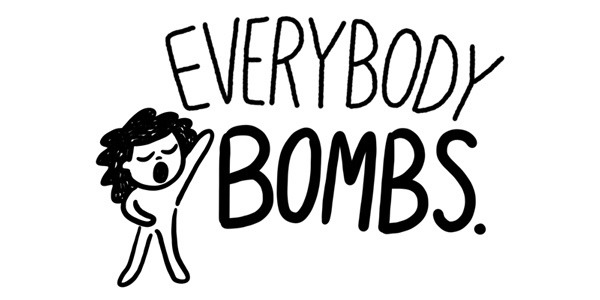 And everyone begins by bombing. Bombing—making or doing something you (or others) think is terrible—isn’t a mistake to beat yourself up about, and its definitely not a cue for you to quit. Bombing is a part of the process. Bombing is when you learn the most about what works and what doesn’t. Bombing is when you prove to yourself that you have the dedication to keep at it, taking it little step by little step. No one is an overnight success. No one just picks up a pen and draws a masterpiece on their first try. To get better at our art, we have to put in the work, keep taking those small steps consistently, and be willing to bomb. Because you will bomb. Again and again and again. But no matter how terrible each bomb is, a bomb is ultimately always a success. Because if you bombed, it means you showed up. It means you tried. It means you haven’t quit. And showing up is the most important thing you can do. Again and again and again. So next time you bomb, don’t be so hard on yourself. Everyone does it. It’s ok. Realize it’ all part of the creative process. And get back in the ring. Again and again and again. Thank you Christine! Your clarity and words of encouragement are reaching me right when I am in need of it most. Just last night, I started devoting focused time at home to an illustration side project that has existed primarily in idea form as written notes/rough doodles and a spreadsheet. For quite some time now, I have limited my creative expression to doodles during lunch or my work commute. I will keep your wise words in mind as I move forward, in hopes that I generate some momentum and see this project through. Great reminder Christine! I don’t know why I have such ridiculously high expectations of myself when I start in a new direction. I really hate bombing. Thanks for the reminder that we all feel this and it truly is a necessary part of the process. I read a quote once that was attributed to Shakespeare , “Our doubts are traitors, and make us lose the good we oft might win, by fearing to attempt”. Your post was spot on. Keep up the good work! Thank you, | By Christine for the kind words and I”m happy that you like my table.